• To improve the quality of flowers, foliage, stems, fruit. Proper trimming is essential in developing a tree with a strong structure and a nice form. Trees that receive a clean or good cut while they are young will require little corrective trimming when they mature. A few simple principles to keep in mind before trimming a tree. Each cut has the potential to change the growth of the tree. Always have a purpose in mind before making any cut. 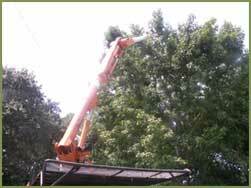 Most routine trimming to remove weak, diseased, or dead limbs, can be accomplished at any time during the year with little bother to the tree. As a rule of thumb, growth is maximized and wound closure is faster if trimming takes place before spring. The amount to trim depends on the tree size. Younger trees tolerate the removal of living tissue better than mature trees do. An important principle to remember is that a tree can recover from several trimming wounds faster than from one large wound. A common mistake is to remove too much inner foilage and small branches. It is important to maintain an even distribution of foilage along the long limbs in the lower portion of the crown. Mature trees require little routine trimming. A widely accepted rule of thumb is never to remove more than one quarter of a tree's leaf bearing crown. The removal of dead, dying, diseased, crowded, and weakly attatched, and low strength branches from the crown of the tree. The selective removal of branches to increase light penetration and air movement through the crown and opens the foilage of the tree and reduces weight on heave limbs and helps retain tree's natural shape. When cutting a big limb, always do the 3-cut method. Cut under the limb about 1/8 to 1/4 into the limb, 14 inches under the point of attatchment. Cut over the limb about 16 inches from the limbs' point of attatchment, leaving the stump. Remove the stub by cutting back to the branches' collar. This reduces the chance of tearing the skin or bark and making it more susceptible to bugs or disease.